While they’re often overlooked in education policy debates, district central office staff can play critical roles in improving schools and ensuring student success. KAPPAN: After we announced the theme of this month’s issue of Kappan — on the many adults, beyond teachers and principals, who matter to student success — we received manuscripts about a variety of people who work directly with children: Librarians, counselors, nurses, social workers, bus drivers . . . but no manuscripts about the people who work in school district central offices (behind the scenes, in a sense). However, and thanks in no small part to your research, it’s becoming increasingly clear that district staff can have a powerful influence on what goes on in schools and classrooms. So tell us a bit about the history of districts and why they matter more now than ever before. MEREDITH HONIG: School districts were created at the turn of the last century, though for different reasons in big cities than in small towns. In cities, people were concerned that the old ward systems couldn’t absorb the growing populations of immigrants and others who were flooding into schools. Plus, the wards were riddled with politics and corruption, with school jobs being traded for political favors. Urban school districts were meant to bring all of this under control, and they focused mainly on operational issues such as managing enrollments and purchasing supplies. But in rural areas, local educational agencies were set up mostly to be fiscal pass-throughs for federal dollars, and as agents that could raise local funds to match the federal money. Over time, though, both big and small districts accumulated all sorts of new functions in response to federal and state policy changes. For instance, when Title I funds became available in the 1960s, they hired staff to manage those funds. When there were new funds for curriculum development, they staffed up those functions. And on and on. Federal and state dollars had what I like to call a “Frankenstein effect” — they led district leaders to add roles and responsibilities in piecemeal fashion, even though those pieces didn’t always fit together. The challenge now is that we need and expect central offices to play a more coherent role in school improvement. We need them to ensure that each and every student has excellent teachers, opportunities for deeper learning, strong instructional leadership, and so on. Districts were never set up to meet those demands, and they evolved in some ways that make it even harder to do so, but we need them to change. KAPPAN: The same goes for all districts, or are rural and urban districts still very different from each other? HONIG: I see more similarities than differences. Obviously, rural districts tend to be small, with only a handful of central office staff members, or sometimes even just the superintendent, while some big city districts employ thousands of people. But they all tend to carry out the same functions: Human resources, operations, curriculum and instruction . . . just at very different scales. And whatever their size, they’re all facing the same fundamental challenge: If we’re finally serious, as a nation, about providing great instruction to every kid — especially students who’ve been marginalized and underserved until now — then how do we reinvent these outdated central offices, so they have the will and capacity to help schools improve in all sorts of ways, from teaching to leadership, assessment, community engagement, and on and on? KAPPAN: What makes you think district staff are the right people to provide that kind of support to schools? HONIG: District central offices have always been well positioned to play a capacity-building role, given their proximity to and knowledge of local schools. It’s worth noting that the charter school sector figured this out early on. One reason they’ve created charter management organizations is because they realized that great schools don’t go it alone — they access support systems for help with their teaching, operations, and organizational development. KAPPAN: What kinds of support are most important for districts to provide? HONIG: A key lesson from our work, both as researchers and as partners to districts, is how important it is for district leaders to make sure every part of the central office — from human resources to operations to curriculum and instruction — is working in ways that support school improvement. Our findings don’t single out certain units as being more important than others. Rather, we find that the entire central office can become a coherent school support system. And in the process, leaders can eliminate tasks and functions that do nothing to help schools become more effective and equitable, and they can redirect resources to tasks and functions that matter. That said, we’ve found that one of the most critical roles in the central office is to provide intensive principal supervision, whether that’s a dedicated staff position or, as is true in many small districts, one of the superintendent’s many functions. To grow as instructional leaders, principals tend to need coaching and support, much more than they need to be monitored or evaluated. Meredith Honig says a key lesson from her work is how import­ant it is for district leaders to make sure every part of the central office is work­ing in ways that support school improvement. Also, we’ve never met a central office that didn’t need to overhaul its department of curriculum and instruction. Traditionally, C&I’s main duties have been to manage funding streams (e.g., Title I), choose curricular materials, and deliver professional development to teachers. However, the way these units are set up, they tend to force the core academic subject areas to compete with each other for limited resources — for instance, if math teachers get more funding, then reading instructors get less. Also, rather than providing ongoing, classroom-based professional development, C&I units tend to rely on meetings and workshops, which may be a fine way to deliver information but, according to the research on adult learning, do little to support real professional growth. In most districts, then, we see an urgent need to redesign the C&I unit to become more strategic about how they allocate resources and more thoughtful about the kinds of teacher development they provide. KAPPAN: You’ve mentioned the human resources staff, too. How are they rethinking their work? HONIG: HR is critical to pretty much everything that goes on in schools, and in districts that are serious about transforming their central offices, HR is changing in promising ways. Obviously, it makes better sense for HR to invest up front in finding the right people, so they don’t have to restart the hiring process a year or two later. In many districts, though, HR scrambles to fill vacancies as fast as they can, hoping people will learn on the job, wherever they’re placed. When we work with central offices on these issues, we try to help them think more strategically during the hiring and onboarding process, becoming much more proactive about looking for candidates who would be a good fit for the specific position. Also, we encourage them to make the process much smoother for principals by, for example, sending them only the most promising candidates, so they don’t have to wade through stacks of applications. And we find that many principals can use help from HR in figuring out which kinds of expertise they should be looking for, given their specific goals for school improvement. KAPPAN: It sounds like district staff are simply becoming smarter about their work, recognizing that they can serve their local schools in better ways than they’ve done in the past. HONIG: Actually, I’d argue that the shifts we’re seeing are much more dramatic than that. It’s not just that they’re getting smarter. The most successful districts have reimagined the whole purpose of a central office. I like to distinguish between reorganization and transformation. Every district undergoes a reorganization at some point, usually when there’s a change in leadership. The assumption behind a “reorg” is: We’re doing the right work, but we could do it more efficiently. So we’ll move around the boxes on the organizational chart, maybe provide staff with new learning opportunities, or rename our units — for example, let’s not call it the office of curriculum & instruction anymore; now we’ll call it the office of innovation & improvement. Because of the Frankenstein nature of central offices, most districts are engaged in many functions that don’t really matter to schools’ results. But, in fact, reorganization isn’t enough. Because of the Frankenstein nature of central offices, most districts are engaged in many functions that don’t really matter to schools’ results. Reorg might enable district staff to become more efficient in carrying out those functions, but that just means they’re getting better at doing the wrong work. Other districts are transforming themselves in more fundamental ways. They’re not just reorganizing. Rather, they’re sitting down with a blank piece of paper and challenging themselves: Let’s not just tinker; let’s ask what kind of school support system we would create if we could do it from scratch. KAPPAN: But do schools even want these supports? If districts redesign themselves, don’t they still have to persuade educators to trust them and use their services? HONIG: Early on in our work on district redesign, many district leaders theorized that if they created high-quality services and made them available, then schools would choose to use them — it was the old Field of Dreams model: If you build it, they will come. One inspiration for this approach was the district in Edmonton, Canada. Decades ago, Edmonton’s system leaders required central office staff to start offering services that schools would be likely to want. Later, schools were given the authority to purchase support services on the open market, and most of them continued to rely on the central office. They trusted the district’s services, not just because of the personal relationships they had built but because of the quality of the work. The Edmonton model isn’t an option for most districts since most are not in a position to create an open marketplace and devolve funding. But the basic dynamic is the same: Over time, district leaders have to build trust among local principals and teachers, and they can only do that by offering services that actually help schools to be successful. Sometimes, though, district leaders offer to provide whatever services principals say they need. But we find that this approach doesn’t work out very well. Unless schools go through a careful process of assessing their needs and sorting through various priorities, they may not know what kinds of support would be most helpful. So they ask for services that don’t end up helping them, which lowers people’s trust in the central office. Recently, one of our partner districts decided to tackle this problem head on. We value teachers and principals’ knowledge, they said, but we want to help them become more systematic in assessing their needs, so that they get better at knowing what services to ask for — for example, what kind of staff they need to hire, or what kind of professional learning would allow them to improve. But that’s very different from how improvement planning happens in most places. Typically, districts give schools a template for reporting their goals, strategies, and other required elements, principals fill them out and hand them in, and then the document sits in a file somewhere. So this is a totally new function for a central office — actively supporting the design and implementation of school improvement plans, turning them into meaningful, living documents. KAPPAN: So in addition to redesigning their approaches to principal supervision, curriculum and instruction, and human resources, another key function for the district is to help schools assess their own needs and priorities? HONIG: Right, and that involves helping schools engage in a meaningful process of continuous school improvement, which also means they’ll need access to data they haven’t traditionally used. Schools are awash in student test scores, disaggregated in all sorts of ways. But if they want to build the capacity of the adults in the building, those aren’t the data they need. Test scores can tell you some things about what the students need, but they don’t give you much useful information about the strengths and weaknesses of your teachers and other staff you might seek to support. The challenge is to provide tools people can use to make their own capacity visible, so they can make good decisions about how to support teachers and principals. Partly this is a technical challenge (what equipment and software should you use, and how do you set it up and use it?) and partly it’s a trust problem (how do you create a culture where teachers and principals are willing to show the central office their weaknesses and ask for support?). Central offices were not set up to be that kind of partner. KAPPAN: But trust is in short supply these days, isn’t it? Throughout the standards and accountability era, districts have been asked to play very intrusive roles, focusing on monitoring and compliance. Hasn’t that poisoned the well, making it hard for local educators to see district staff as potential allies and supporters? HONIG: Yes, central office staff have had a lot to manage, trying to navigate federal and state requirements that were not good for teachers or school leaders, and they’ve often been cast as the bad guy. For example, largely in response to pressure from Washington, states required districts to step up their teacher evaluation systems. Given the extensive reporting requirements, many principals have found that they only have time to conduct brief classroom observations and rate teachers on a numerical scale, but this gives teachers little information about how they’re teaching and what to do to improve, so they become frustrated and resentful. Who gets blamed for all of that? Often, the district. KAPPAN: For central offices that are trying to redesign themselves, is it hard to recruit people who not only want to work in such a fraught environment but are capable of providing great support services to schools? We’ve also seen changes in the pipeline of people moving into the central office. When the focus of the work shifts from compliance to capacity building, a lot of great teachers and principals choose to apply for those jobs because they know they can have a real impact on the whole district. KAPPAN: Tell us about the District Leadership Redesign Lab. In addition to conducting research, how do you partner with districts? 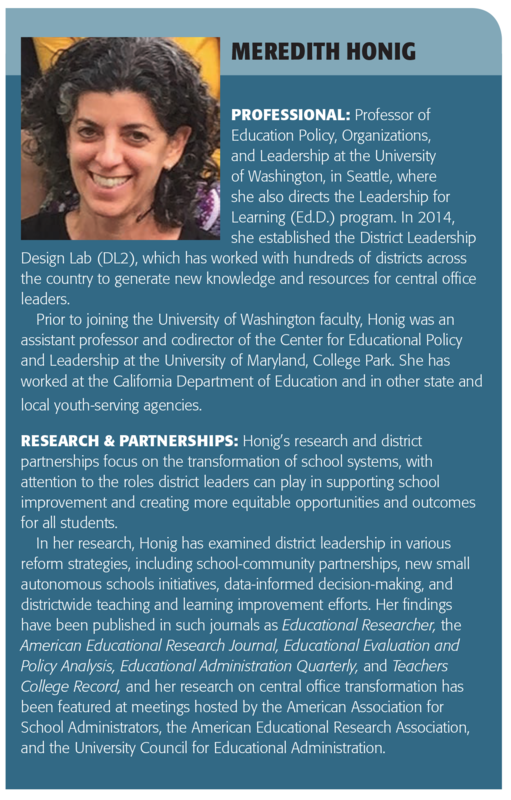 HONIG: I formed DL2 several years ago because superintendents were asking me for help in using research findings to inform their central office redesign efforts. We explored different models for providing such support and found them a poor fit for what redesign takes. For example, many support providers focus just on human resources, or just on principal supervision, or on another single part of a central office. But district transformation requires broader engagement than that, involving every unit. So we needed an approach that would allow us to be more nimble and comprehensive. Also, rather than just sharing our best thinking, we wanted to make sure to stick close to the research. We think it’s best for district leaders to adapt our ideas to their own contexts, rather than just doing what we recommend. But at the same time, the research does help us to predict that certain strategies will or will not work, and it’s important to let people know that before they go off in the wrong direction. We also learned not to take over the central office redesign process on behalf of district leaders. We’ve seen this happen with many vendors who’ve received contracts to deliver services. In fact, we studied the impact of such approaches for supporting central office transformation and found that when outside providers were too heavy-handed, their work resulted in little to no lasting change. Instead, central office leaders need support that allows them to lead the work themselves. So we approach our work as district design partners. We help staff access the latest findings about central office practices that support equitable teaching and learning, and we help them design their own approaches that build on and extend that research. We then support them in leading the work themselves through consultation and the generation of tools, more research, and real-time advice. We work most intensively with a small number of districts across the country that serve as learning labs — places where teams from other districts can go to see the work in action. In some districts, we just play an advisory role, or we bring in outside partners to help with a specific issue. (For example, we recently arranged for a national expert in HR business processes to consult with a district that was struggling to revamp its HR system.) Other times, we step in and help the district fill capacity gaps. For instance, when one district bravely decided to redesign its school improvement planning process, it found that it didn’t have staff with the time or expertise to lead such a process. So we stepped in and played a more significant role in the redesign for a while, until district staff were ready to take over the work. Basically, our goal is to work ourselves out of a job by helping central offices build their own capacity, so they don’t have to keep hiring outside experts forever. Actually, that’s another area that we’ve focused on with some of our partners: We try to help them rethink how they negotiate relationships with outside providers. As our recent study noted, professional development often leaves people reliant on more professional development. So we try to help districts confront that dilemma and become better brokers of outside support. Ideally, they can find partners who will help them build the capacity to do the work without assistance. KAPPAN: But whether districts work with you, hire another consultant, or develop their own capacity, isn’t it expensive to redesign the central office? How do you persuade a district to invest in this kind of work? HONIG: What’s great is that redesigning a central office doesn’t mean adding new roles and responsibilities. Our research does not at all suggest that central offices add programs or staff or other costs. Instead, transformation is about taking core functions — like HR, curriculum and instruction, and operations — and shifting the work they do every day to make it more relevant and effective. If anything, district redesign tends to be cost-neutral because it’s a process of figuring out how best to repurpose existing resources. Central office transformation is about taking core func­tions — like HR, curriculum and instruction, and operations — and shifting the work they do every day to make it more relevant and effective. KAPPAN: But that means letting go of some district functions, right? Isn’t that a painful decision for central offices? How do they decide which responsibilities to drop? HONIG: We see a lot of low-hanging fruit. For example, a lot of central offices still handle their HR processes on paper, and they’d save a lot of time and money by automating those processes. Also, most districts spend enormous amounts of time monitoring how schools use resources, even though schools are being held accountable in other ways, leading to costly redundancies. For example, one district that we work with has always asked its schools to report a ton of data, focusing on things like parents’ participation on school improvement teams, or the performance of English language learners. This reporting takes a lot of staff time — they have to make requests, follow up with schools, collect the data, combine it into single data files so they can analyze it . . . But we found that much of the data that the central office was requesting was information that they had provided to the schools in the first place. The schools were just reporting it back to them. So the district staff could have just walked down the hall and asked their data and accountability staff for it. Or they could have put the data into a system more accessible to central office staff. Like I said, there’s a lot of low-hanging fruit. KAPPAN: How do you persuade district staff that if they make the sorts of changes you advocate, they’ll see real benefits over the long term? Do you have data showing that, for example, better principal supervision and better school improvement planning lead to better K-12 education? HONIG: In our research, we’ve been able to connect some specific practices to certain school-level shifts. For instance, giving principal supervisors more time to provide coaching and mentoring does correlate to principals spending more time on the instructional leadership activities that researchers have found to be effective. So yes, we’ve been able to make some of those associations using observational data. But if you want to gauge the effects of this work, you need to hold people accountable for meeting reasonable goals, using realistic indicators of success. Sometimes districts make the mistake of saying, “Let’s see if overhauling the HR department has an effect on student test scores,” when that link is tenuous at best, even using state-of-the-art statistical methods. Or they set a performance goal that’s easily measured but not relevant like, “Let’s see if HR can respond to principals’ requests in two hours rather than two days.” Well, if they’re not responding in a helpful way, what does it matter how fast they respond? A much more relevant indicator of HR’s performance would be, say, the extent to which principals are able to hire people whose skills are aligned with their school improvement plans, which you can measure through surveys or interviews. So yes, you can see and measure the impact of district redesign, but you have to choose the right leading indicators of those changes. KAPPAN: Can you point to specific districts that have made major improvements over time, becoming agencies that provide truly helpful services and supports to their schools? Originally published in April 2018 Phi Delta Kappan 99 (7), 42-46. © 2018 Phi Delta Kappa International. All rights reserved.